Anyone who reads my blog semi-frequently knows that I read junior fiction often enough, and a quick glance at my 'about me' will also let you know that I'm 22. In all honesty, there was a time in my teen years when I would never have read junior fiction, save Harry Potter, and I especially wouldn't have let myself be seen reading it. This was because a) my high school friends would have never let me live it down, and b) school had taught me that people were supposed to stick to their 'reading level.' Somehow I got the idea that we outgrow books like we outgrow our old jeans or our favourite Spice Girls band t-shirt. Earlier this week I read an article for The New York Times by Joel Stein called "Adults Should Read Adult Books." The author of this article actually hasn't read any of the books he mentions in his article (The Hunger Games, Harry Potter, Twilight) so I didn't take his article too seriously (you can read a very good commentary on the article here.) While this article reminded me of one of my number one pet peeves (people judging others based on what they read) it also made me think about why I still read books that are written for children. Is it because I'm lazy and don't want to take the time to read an intellectually stimulating novel written for people my age? While people like Joel Stein would think so, here are the real reasons why I read kid-lit and why I will never stop. 1. I don't want to forget what it's like to be a kid. When I was a kid I was worried that I would turn into one of those adults who have completely forgotten what it was like to be a child (like Ms. Trunchbull in Roald Dahl's Matilda.) Reading kid's books instantly helps me remember even more vividly than usual what it's like to be seven years old. I never want to be one of the adults The Little Prince describes, or turn into a villain worthy of a Roald Dahl book. While not reading children's books definitely doesn't mean you will suddenly be unable to relate to children or become every kid's worst nightmare, I think reading children's lit helps ensure that you will never forget. It's nice to be able to read a book and find that it permanently holds a part of who you used to be and what it felt like to be that person. 2. I can learn a lot from books like The Little Prince, Peter Pan and Alice's Adventures in Wonderland. And from so many other books for children. Sometimes books for kids are full of simplistic wisdom. The first that comes to mind is The Little Prince by Antoine de Saint-Exupéry, which is pictured above (from PosteSecret.) In 91 pages this book can teach you about love, what's important in life and what you should never forget, no matter how old you are. When writing Peter Pan, J.M. Barrie was inspired to write a book about a boy who will never grow up based on the death of his older brother David, who died just short of his fourteenth birthday. Alice's Adventures in Wonderland by Lewis Carroll is about the solitary journey into adulthood, the loss of childhood and how one can never go back. The Golden Compass by Philip Pullman offers a different perspective on the fall in the Garden of Eden and equates the fall with consciousness, not sin. Harry Potter is not only about the battle of good versus evil between Harry and Voldemort, but also about the internal battle within us all. 3. I don't care if people judge me. If someone on a plane sees me reading The Penderwicks or The Invention of Hugo Cabret and assumes that I'm either lazy or not very bright, then that's fine. Fortunately for me, I'm confident enough with myself to be seen reading a book that was written for ten year olds. When I was younger I didn't feel this way, as I mentioned earlier, but thankfully I've grown up enough not to care anymore. C.S. Lewis wisely said "When I became a man I put away childish things, such as the fear of childishness and the desire to be terribly grown up." 4. It can be just plain fun. I read for a lot of reasons: to discover things I didn't know before, to see the world through someone else's eyes, to find adventure, to learn about what was, to learn about what could be, to escape, to fall in love or to go to places I may never get to see in reality. But sometimes I just want to read a book that's a lot of fun. While it is not true that books for kids are always just for entertainment, some of them are a lot of fun to read and sometimes that's what I need. Roald Dahl is a good author to go to when you want to read a fun book that reminds you what it's like to be ten, and every once in a while that's exactly what I'm looking for. 5. I try not to underestimate kids or the books that they read. While it is true that I liked some embarrassing books as a kid (the Mary-Kate and Ashley mystery books first come to mind) I also liked a lot of things that I'm sure adults assumed would go right over my head (like the dark humour and literary references in A Series of Unfortunate Events.) I'm sure there are people who will hear a child praise a book and patronize them, assuming that this book is much too silly for anyone over the age of twelve. You can even see this in some children's books that are condescending and talk down to the reader (another pet peeve of mine.) Believing that all children's books are subpar means believing that children are essentially silly and waste their time on less than satisfactory literature. Many kid's books are popular for a reason: they're good. 6. Just because a book is written for a younger audience doesn't mean it doesn't touch on important issues. This makes me think of a quote from Madeleine L'Engle, writer of A Wrinkle in Time: “You have to write the book that wants to be written. And if the book will be too difficult for grown-ups, then you write it for children.” Dr. Seuss's books could be written off as simply being wacky rhyming books for kids, but in reality they are about a lot more than that (x). Just because the writing isn't necessarily challenging doesn't mean that it doesn't touch on some challenging issues. Remember, these books were written by adults. 7. I try to be open minded about what I read. If someone recommends me a book that they love, I'm going to read it whether it's for children, teens or adults. If I was less open minded about reading I would have missed out on a lot of amazing books. 8. I know that writers of junior fiction can be just as talented as writers for adults. A lot of people seem to think that junior fiction has no literary merit, or even that writers of children's books do so because they couldn't write for adults. Sort of like 'those who can't teach, teach gym,' but instead 'those who can't write, write for children.' This is, of course, completely untrue. Some very talented writers of junior fiction include Neil Gaiman, Philip Pullman, L.M. Montgomery, Lois Lowry, E.L. Konigsburg, Madeleine L'Engle, Lewis Carroll, C.S. Lewis, J.K. Rowling and Frances Hodgson Burnett. In fact, some of these writers also write for adults. 9. Sometimes I like to escape from the adult world. Let's be honest: sometimes it's nice to forget about the lows of adult life and read books about adventure from the eyes of a wide eyed child protagonist. 10. Because a good book is a good book. Who cares which section of the library it's in? You see books that are torn between the YA and the Adult Fiction section, and wherever you find The Book Thief, it's still going to be amazing. I think people should read whatever they want, no matter what the intended age group is. While I think that there are a lot of good reasons to read junior fiction, that's all beside the point. Whether you're reading The Hobbit or a Mary-Kate and Ashley mystery novel, that's your choice and no one should judge you for reading whatever it is that you're reading. Personally, I hope that I never stop loving something just because it's not intended for my age group. Feel through to respond with your comments on children's literature and the adults who read it. I love this post. I completely agere that reading children's books is both fun and important. Sometimes I think it's the best medium in which to tell a story because all the adult mumbo jumbo is boiled away. It's story telling at its most pure. I feel this way too. I like to read YA books and I'm 23. I consider them research because I feel like I'd write a YA book over an adult book, partially because that's what I like to read. It's sad that we feel like we have to hide what we read if it isn't age appropriate and even more sad when films like Hugo and Extremely Loud are Oscar noms. YA books become popular and then adults feel like it's ok to read them then, but really books are book just read em. What a great post! I completely agree. I read children's and teen books all the time. Actually, that is mostly what I read. I'm a children's librarian, so sometimes when I tell someone about a children's or teen book, they will say something like "well that is for your job because you are a children's librarian." But the fact is, I read what looks good, and I won't read any book just for my job. I read children's and teen books because I love them! And because they are so good! I'm not embarrassed, though. Maybe that is because I am 28, and am comfortable in my own skin. Well, at least with my reading choices. Wonderful post! I, like you, rarely used to read children's books because I figured I had grown out of them or that I'd be made fun of. 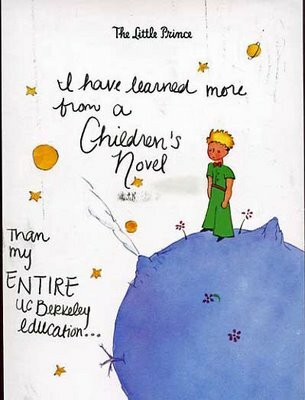 But then I read books like The Little Prince, Liesl & Po, and Eight Keys, and it made me realise what I'd be missing out on if I only stuck to 'adult' books. I also feel the same about YA books. I'll have to check out Eight Keys, it looks really good! Kind of reminds me of Flipped, for some reason. Ooh I wonder why. I think you'll really like it. Great post! I'm 21 and recently finished my English degree, and I still find myself reading a lot of children's fiction for the same reasons you mentioned. My mum is the same - when I was younger she would always borrow my books and we'd chat about them when we were both done reading. Bravo!!! I'm so pleased to have found your blog and this post first! I occasionally get funny looks or comments (I'm 22) when I read YA or other "kids' books" in public, but as you said, there's a kind of magic that sweeps you away when reading books meant for wide-eyed, open-minded younger people. I was also exposed to a ton of wonderful children's books and YA novels when I worked in a children's bookstore in high school and through college, so that whole world has a very special place in my heart. I'll probably never stop reading it. I came here through the prettybooks tumblr, and I have liked this post so much that I just finished a translation to Spanish that I hope you don't mind I post on my blog. Most of my readers don't understand English as I do, but I DEFINITELY want them to read this. I will of course acknowledge you as the author and link back to here in case someone wants to read the post in its original form. I totally agree with you. Thanks for putting so well down in words some of my deepest thoughts about this issue. This is my thoughts exactly. I have always loved children's book and probably always will. The same way I feel about Disney. This was such a welcome relief to read after spending my "college years" trying to find "adult" books i liked and always coming up short. Well, now I'm pregnant and there's nothing i love more than curling up in bed reading my favorite YA novel and thinking about how wonderful it will be to inspire my kids to love books as much as i did. Thanks so much for reminding me that loving children´s literature is okay. P.s. If you've never read any of Sharon Creech's novels/poetry you're missing out! They've been among my favorites since i was in the fifth grade (I'm 21 now). I love this. The other day my friend was asking me that why do you read childrens books and i couldn't find a satisfactory answer for her but now i do. I understand what you are saying. I'm in my early 30s, and have recently developed an interest in David Walliams' books, like Gangster Granny and Mr Stink, which I've heard are brilliant and very funny. Furthermore, I've heard they contain adult humour.